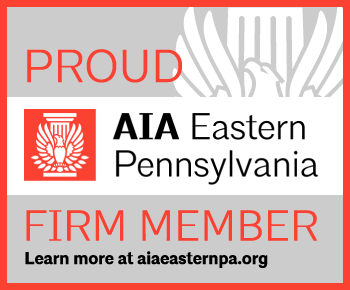 Feb1Architecture…living in harmony with mechanical, electrical and plumbing work…. In any DIY project, you need to know when to call in the experts…on our basement renovation, we did the design and a ton of the manual labor ourselves. However, neither of us was comfortable with electrical work for such a large project (we didn’t want to burn the house down by doing something incorrectly); plumbing is something we didn’t want to mess with (um, toilet flooding, not good); and we had an existing HVAC system that was large enough to handle the space but we didn’t know how to connect ducts to the existing system or how to control the flow. So we called in the experts. Robert Williams & Daughters (yay daughters!) did our plumbing work for us. We debated between different options for what to do – we wanted a toilet in the basement but were not crazy about tearing up the concrete floor (or the associated expense). Robert recommended a Sani-flow toilet. This fixture has a grinder pump and reservoir that does just what it sounds like, grinds up the waste and toilet paper, and pumps it up instead of down. So the waste flows out of the back of the toilet into the pump, then is pumped over the ceiling in the bathroom, between the ceiling joists and down into the existing waste line. The unit itself cost about $1,100 for the toilet, pump and associated piping, and installation was about $1,800 for the toilet installation including roughed-in pluming for a bathroom sink and a bar sink. And he used PEX piping. PEX is a cross-linked, high density polyethylene tubing that is inexpensive, very flexible and much easier to install than copper piping, using fittings instead of welding/soldering. 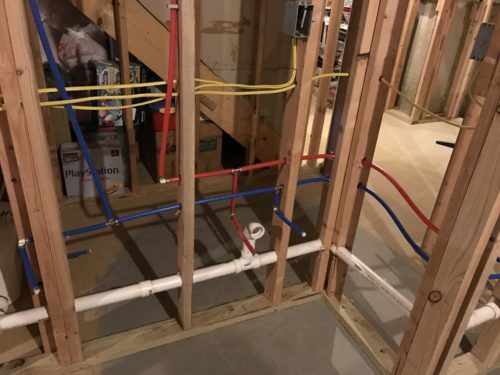 Now PEX piping is not something I would recommend for whole house plumbing – it is a plastic product and had been known to leach trace amounts of chemicals into the water (and frankly, if I had done better research before he had come to do the work, I may have insisted on copper piping). But knowing that the water use in our basement will be minimal (hand washing, toilet filling, glass rinsing), I have accepted this for our conditions. It is recommended if you have PEX piping to filter your water prior to drinking it. And in our house (we have copper piping throughout), we have not had very good luck with copper plumbing…pin-holes, bad joints and leaking. So we’re giving this a shot. Second, we had the electrical work done by Bergey’s Electric. 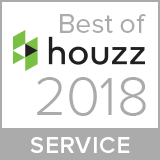 They have been an excellent contractor to work with, very flexible, patient, and offered many great tips and different ways to wire our basement. Our lighting design included mostly recessed “can” fixtures (sometimes called “high-hats”) with some decorative accents. 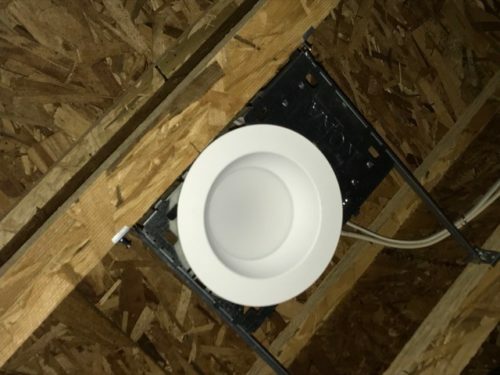 We learned quickly how much space was needed for certain fixtures and the many different junction box types that exist. And of course everything fell in line in the wrong places (ducts in the way, joists in the way of centering fixtures, etc.). We used some very low profile junction “plates” to clear ducts in certain places and they worked out great! And all of the fixtures we are putting in are LED fixtures, which are a very energy efficient option to replace incandescent fixtures. 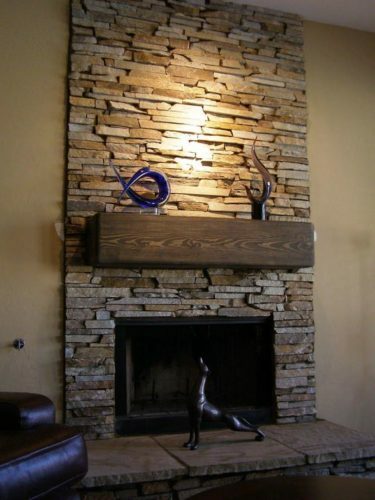 I will talk more about lamps and lighting in a future segment. Lastly was the mechanical contractor, Hannabery HVAC (by far the smallest scope of work). We just needed to add some supply ducting into the space to provide heat and air conditioning to the space. 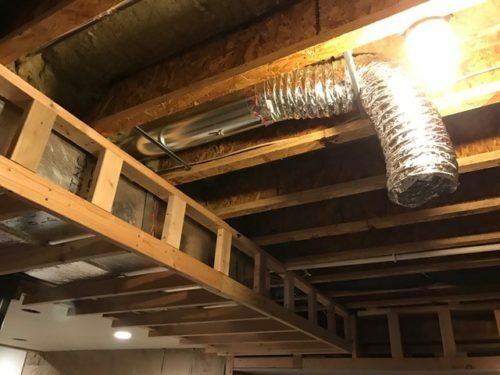 Always remember, when you add supply, you also need to make sure there is a return duct to help draw the air through the space. On ours, the return duct is rather large…and thankfully the contractor gave us a cover to keep it from sucking in all sorts of construction dust during the rest of the renovations. Already it is more comfortable down there!